* No finger contortions are needed to operate the easy-to-reach buttons. * High precision means you'll enjoy smoother tracking on just about most surface. * The vertical "handshake" position encourages a neutral wrist and arm alignment for greater comfort and better health. 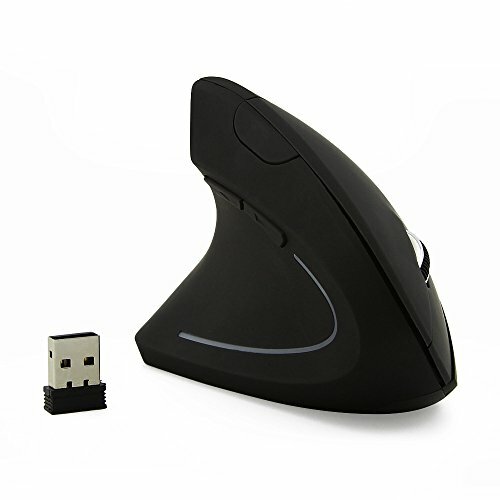 * The wireless vertical ergonomic optical mouse is designed to reduce forearm twisting and the resulting repetitive stress and pain. * Ergonomics vertical wireless mouse, comfortable touch, working on many different surfaces and ideal usage for home, office or game. * Change the Sensibility of Mouse Freely: You are free to adjust the mouse sensitivity to match your activity. There are 3 DPI levels available (800-1200-1600). Size: 4.92" * 2.56" * 3.23"
All CHUYI products are constructed to the high standards and rigorously tested at every stage of production, so you can be confident in the outstanding quality, performance and reliability.